Let’s all look closer and deeper at everyone we meet. Enjoy! Wendy and I are on the road heading toward Bend, Oregon for the birth of our granddaughter. No time to write, but we did take a wrong turn in Salt Lake City. I humorously told Wendy, “There must be a reason for us getting lost.” One minute later, we saw a young man sitting by the side of the road holding a sign: JUST HAD A BABY GIRL. NEED MONEY. We slowed down and gave him five dollars. This encore message was first sent out on September 19, 2011. Look in the mirror. What do you see? You see you, looking right back at you, right? There you are: nose, ears, eyes, eyebrows, lips and hair. Look closer. Is that really you in the mirror? And, really, who actually are you? Are you your nose, ears, eyes, eyebrows, lips, hair…? That is you, but is it actually who you are? And why do we even look in the mirror, anyway? I usually do it for one reason, to see if I look OK. Is my hair neat? Is my beard trimmed? Is there a piece of lettuce stuck in my teeth? Are my buttons buttoned? Am I dressed well enough for my next appointment? 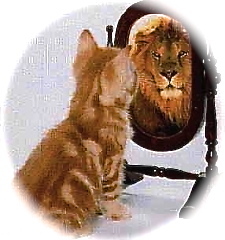 A mirror gives us some information, but it doesn’t really tell us much about us. We get bits of surface data that we use for an on-the-fly adjustment or a temporary vote-of-confidence that lasts only until the next visual assessment. So far, there’s not a single soul in sight. In general, we are more adept at seeing outer garments than we are at seeing our soul and the souls of others. For the purpose of today’s message, soul simply means our non-material essence: our hearts, our reasons for being, our deepest beliefs and values. Each of us, underneath our physical and emotional garments, is one-of-a-kind. There never was, and never will be another you. It takes much more of our humanity to connect with the inner essence than to see just the outer garments. Here lies one of humankind’s most important challenges: see more souls! Imagine if we were like Superman and could see past every person’s garments and connect with each person’s essence. Well, we do have that capability and we all can improve upon it. First, and foremost, you have to want to. Second, begin to notice when you are paying most of your attention to the garments. I can easily get stuck on beauty. Not a bad thing to notice, but definitely not essence or soul. I can get stuck on a severe disability. That’s a garment that Jessie, my youngest daughter, first taught me to see past. I can zero in on a person’s political rhetoric, their Mercedes-Benz, their tattoos, piercings or orange hair. If I think someone has offended me, I can easily get caught on resentment. No soul-seeing there. Then, everything begins to change. See more souls and you will surely make it a better week! Note: Please write and tell me your soul-seeing success stories and challenges. Our pooled wisdom can benefit all of us. Feeling lost, amigo?Account help, how-to videos and advice.